Is AustralianHelp.com as bad as online user reviews say it is? No, it is not, but AustralianHelp may receive fewer online complaints if they were to lower their prices. They are offering essay writing services at prices where most people expect at least a degree-qualified job, when most people are getting a Wikipedia rewrite job. If the website simply lowered the expectations of visitors rather than ramping up expectations, then fewer people would be disappointed. The sort of help that AustralianHelp.com gives is not terrible. It is just that the quality of their work starts to strain at higher levels. For example, if you want something at high school or freshmen level, then you will get a passable essay, but anything higher than that and the standard of work they offer is not up to the task. Their editing is awful, but they do seem to hire real proofreaders. We had a hard time judging their proofreading because most of the content that college and university students send their proofreaders is okay-to-good, so it is not as if the proofreaders have a lot of work to do. AustralianHelp.com has awful editors because all they do is snip bits of your work out and then rearrange it. Their editors do not understand the concepts at work within your essay, which is why they are awful at editing your work. Even high school students should avoid their editing services. 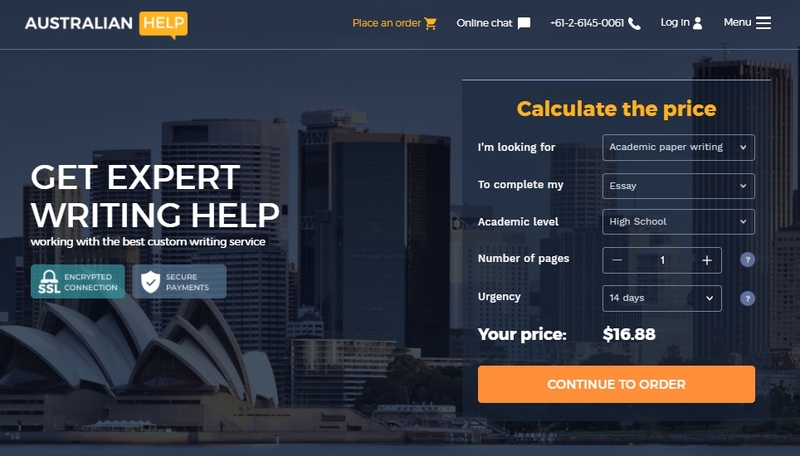 AustralianHelp.com does allow you to get a rough estimate of your essay cost through the use of their quote calculator. Give them your paper type, essay type, academic level, number of pages and deadline, and a quote appears in real time. The cheapest price they offer is $16.93 per page, and that is for a high school level paper with a 14-day deadline. Pages of academic work (not admission help) cost up to $62.54 per page. AustralianHelp.com uses the standard 275 words per page rule. AustralianHelp.com has a bunch of free features that include free formatting, free bibliography, a free outline and free title page. They also give free amendments, but you should never shop with an essay writing service that doesn’t offer free amendments otherwise their writers have an incentive to mess up your order. AustralianHelp.com also gives you a free plagiarism report, which is a little self-sabotaging since they should know if the piece is plagiarism free because they wrote it. The company also has a first-time discount of 15% off if you use their “15OFF” code. Their customer support is about as helpful as the fake testimonials that they post on their website. Maybe their phone support is different from their email support because the email support firstly sent an automated message, and later sent us a message from a real person (it had spelling mistakes, so we knew it was a real person). The phone service seemed very scripted to the point where we think it may have been one of those dial-a-receptionist service.